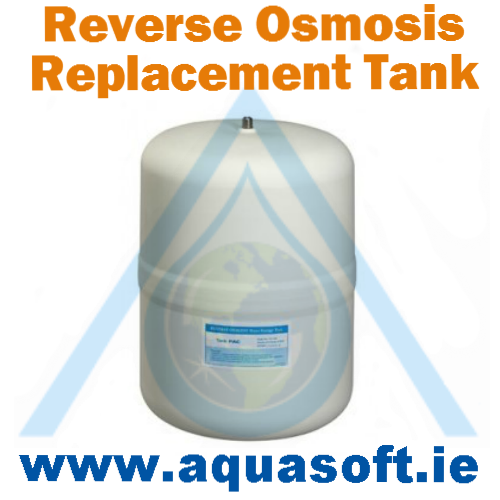 Aquasoft™ Ireland TK2 Reverse Osmosis replacement Plastic water storage Tank. This 3 Gallon replacement tank offers superior build quality and bladder storage construction. NSF® and the Water Quality Association® certified for human consumption ensures safety, Hygiene, client confidence and best product for you and your family. This tank comes with an optional stand and it can be side mounted if desired. It stands on its bottom fine - in fact, it's more stable without the stand. 3 gallon Plastic steel Tank with tank shut off valve and stand.